You'd be amazed how few of the best spells in Magic are sorceries. "Counter target sorcery spell" would never be worth playing as its own card. Destroying creatures is nice, but the power restriction is a little tight. Still, it'll be able to kill creatures that serve to block and do little else, or small utility creatures like Guildmages... or creatures you've just hit with a Downsize. The third option is completely random-- the best it'll do is make sure that their very next draw is the worst of their next three, but there's no guarantee that they'll have a "bad" card in their top three. And if you end up seeing three of the same card, or three cards with Scavenge or Flashback, you may accomplish nothing at all. Only a dedicated mill or Dream Salvage deck could get any use out of the third ability. So, we have a choice between an incredibly narrow counter, a fairly narrow kill spell, and a perplexingly useless mill effect. Dimir Charm is interesting in that it combines three effects that are well established on older cards, reminding one of Envelop, Swat, and various mill cards that were not particularly memorable outside of dedicated decks. I expect having them all in one place, on one card, in these colors, to be nothing short of amazing. People who aren't playing sorceries probably still have creatures, and failing that they always have a library (yeah, okay, unless they're Dredge). Today's card of the day is Dimir Charm which costs one Black and one Blue for one of three effects. The first effect counters target sorcery spell which is fair for two mana, but quite situational and Blue has no shortage of more flexible countermagic choices. The second effect destroys target creature with power two or less which is again fair and again surpassed by many removal spells in Black for the same mana cost. The final option allows you to look at the top three cards of a player's library and place two of them in the graveyard, returning the third. Surprisingly when the other choices are countering and removal it is the library manipulation that is probably the strongest as it can feed graveyard effects and help put a card to benefit from that into your hand on the next turn. 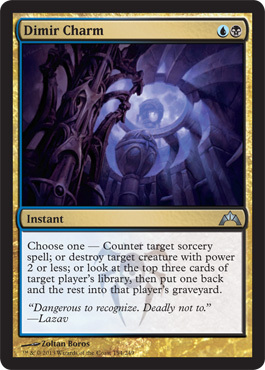 The three options are nice and the value of the third may get it into a few decks, but overall with draw power in Blue to maintain more powerful cards in hand this charm is a little too weak for widespread play. In Limited the lack of other removal options and higher odds of a sorcery being a trump card increase the situations where this would be valuable. The third effect is of minimal use in the format with fewer graveyard benefits and the card disadvantage to just select the top card of your library. Possibly a third or fourth pick for weaker packs when in color and should be included for Dimir sealed decks. Welcome again to Charm week here at Pojo.com's card of the day section. Today we are looking at the Dimir Charm from Gatecrash. Dimir Charm is an uncommon instant that costs one blue and one black mana. Dimir Charm has three abilities to choose from when casting. The abilities are: Counter target sorcery spell; or Destroy target creature with power 2 or less; or Look at the top three cards of target player's library, put one back and the rest into that player's graveyard. As with all the Charms, it is so nice to have three abilities to choose from for just two mana. The Dimir Charms are nice but in my opinion, in no means game changers. Sure, countering a sorcery can be handy, but it would have been nice if they made it a straight counter target spell. And while destroying a creature is nice, Hexproof and indestructibility make this ability very difficult to take full advantage of. Perhaps the best ability may in fact be the last one. Being able to check out the top three of an opponents deck and alter their draw and perhaps deny them some useful cards is very useful. And being able to use it on yourself could also be very strategic, depending on how your deck is designed. Of course the last ability is also great for if you have the Dimir Guildleader, Lazav out. Then you can send the worst of the creatures to the graveyard and have Lazav become that creature. Not the strongest of the Charms in this set, but as all of the Charms are, still quite useful.